Do you want the best jointer planer combo for personal use or your workspace? Whichever the case, this list has got you covered. Also, I understand the biggest problem faced by hobbyists and professional woodworkers. And that is garage/workshop space. That’s why I came up with this review in the first place. A jointer planer combo machine is specifically designed to help one save space. The bad news, however, is that the internet is full of mediocre marketers. Most of them are just out on a quest to convince you to get products that’ll pay them high commissions. And that is regardless of the product’s quality. That’s why I decided to include a buying guide that’ll allow you to choose the best jointer planer combo out there. Choose a machine that can fit the maximum width of timber you’ll be working on. 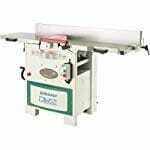 Jointer Planer Combo Machines’ lengths range from 50 to 80+ inches. While choosing the best appliance, do not just consider the total length of the tables. Also, take into account the lengths of the outfeed and infeed tables. This allows you to know the exact length of timber you can feed into the machine. To figure this out, look at the product’s specifications or brochure. The brochure or specifications list should include a feed per minute number. This tells you how many feet of wood you can feed through the product per minute. Consider whether the appliance boasts a spiral/helical or standard cutterhead. Standard cutterheads have two or three straight knives that chop off the wood’s surface. A helical/spiral cutterhead, on the other hand, may come with 30, 40, and at times, 50 helical knives that shear the lumber surface more finely. Mainly inspect what the table, fence, and stand are made of. Less accurate and less precise machines that need lots of adjustments and do not stay level are made using aluminum type materials. High-quality alternatives are usually made of stable and more expensive steel as well as cast iron materials. Just like everything else in the world, Joiner Planer Combo Machines also have their disadvantages. However, note that their advantages outweigh their disadvantages by a wide margin. To give you a better idea, below is an enumeration of their main pros and cons. Since it is a combination of two different machines, a jointer and a planer, a jointer planer combo saves on space. If you’re a woodworking aficionado, then you understand the importance of saving space in your garage/workshop. With the best heavy duty jointer planer combo, you have the capacity to construct furniture that are much bigger using the same machines. The product only comes with one cutterhead. This means it tends to wear down a bit faster compared to if you had picked a separate planer and a separate jointer. Changing between the modes is a bit time-consuming. I hope you now understand how to choose the best jointer planer combo machines. With that lesson in mind, let us check out my selection of the best ones in the marketplace. With a versatile and practical design, this jointer planer combo is the ultimate solution. It was specifically designed for small to medium workshops who want to save on space. Better yet, I guarantee that this machinery will leave you in awe. That’s regardless of whether you’re an advanced user or novice woodworker. This is also the heaviest jointer planer combo I selected as it weighs roughly 500 pounds. This weight is mainly because it is designed using durable and thick materials. The planer beds are made of cast iron whereas the base stand is made of steel. Jet JJP-12 boasts a compact design that will make it ideal for anyone who would like to save space in their workshop. 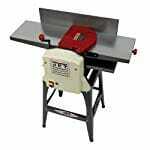 You can also use the equipment for some of the most demanding woodworking projects. That is because it’s armed with a 3 Horsepower induction motor. The only difference about this product is the fact it retails with a bridge style guard or European Style Blade Guard. This feature ensures that it will not pivot out of its way as you push the piece of wood through. 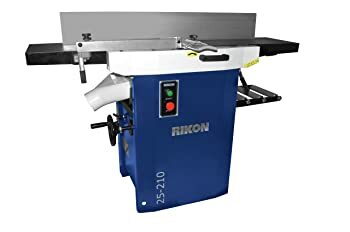 The Rikon 25-210 jointer planer combo boasts a cutterhead with a 2.5 diameter and knives that spin at a speed of up to 4,800 Rotations Per Minute. The cutterhead also delivers approximately 14,400 cuts each minute it spins. The fence extrusion is designed using extremely strong aluminum. You can quickly tilt it to an angle of 45 degrees using the adjustable knob. You can also easily remove the outfeed table to work on the flip levers. You’ll mostly have to do this as you change from the jointing mode to the planning mode. To remove the fence, quickly turn the spring operating lever. The dimensions of the outfeed and infeed tables are both 19 ¾ inches. 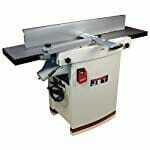 I call the Rikon Power Tools 25-210H jointer planer my secret woodworking gem. 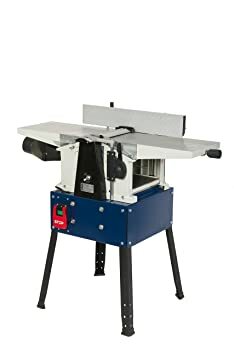 It is an extremely powerful jointer planer combo and I’m confident it will be a suitable addition to any woodworking garage. Using a jointer planer combo has been made extremely easy by the Grizzly G0634XP. Better yet, this appliance saves on space and can execute a wide array of tasks without complicated procedures. Even a first time user can learn how to fully operate the machinery after a couple of uses. Thanks to its cutterhead speed of 6,500 RPM and 2 knives, It won’t take you hours to complete your projects. On top of that, the Grizzly G0634XP delivers an ultra-smooth finish at the end of each woodwork. 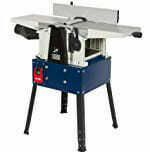 Price range is one of the main problems most people have when it comes to picking the best jointer planer. With this constraint in mind, I also decided to include one of the most affordable jointer planers out there; the Jet JJP-10BTOS. The other most noticeable thing about this product is the ease with which you can quickly switch between the planer mode and jointer mode. You can easily do it under a minute. In addition, the 116-Volt motor rotates the cutter head to deliver up to 18,000 cuts per minute. Since all the knives on the cutterhead work in tandem, they retain their sharpness for relatively long periods. This product is not the cheapest selection in this enumeration. However, Rikon 25-010 eliminates the need for two separate appliances without you having to drain your account. Better yet, this equipment is lightweight. This implies that it boasts a compact size and you’ll find it easy to move it around. It is not as powerful as some of the jointer plane combo machines in this enumeration. But, the 1.5 Horsepower motor permits you to make complex and simple projects a success. In addition, the cutterhead has 3 HSS knives and delivers up to 14,400 cuts per minute. Two more features worth mentioning in this review are the quick release table locks and the adjustable fence. I know this enumeration does not include many machines. However, rest assured that the few ones I have selected are the best ones. Better yet, they’ve been designed by some of the most reputable brands in the power tools sector. These manufacturing firms are well known all around the world. And they gained their repute by ensuring they only sell innovative and sturdy tools. I hope my review has helped you make a well-informed decision.